Halloween, also known as All Hallow's Eve, is believed to have originated from the ancient Celtic Festival of Samhain. This celebration dates back 2,000 years in what is now modern day northern France and Ireland. The Celts celebrated the New Year on November 1st, which marked the end of the summer and the harvest and the beginning of the cold, dark winter. Winter was associated with human death to the Celts and they believed that on their New Year's Eve the worlds of the living and the dead became one and that the ghosts of the dead came back to Earth. It was a common belief that these ghosts would cause havoc such as sickness or would damage crops. And so the Druids, or Celtic Priests, would make gigantic bonfires, and the Celts wore masks and costumes in an attempt to mimic the evil spirits or appease them. The Celts believed that the Druids would be able to communicate with the ghosts and they could then make predictions about the future in hopes of protecting their crops and surviving through the unforgiving winter. In the 8th Century, Pope Gregory the 3rd established All Hallows Day in attempts to distract people from the pagan practice of Samhain. All Hallows Day is also known as All Saints Day and was celebrated on November 1st. Europeans accepted this holiday and practiced it but also continued their previous celebrations and soon Samhain became known as All Hallows Eve. The Potato Famine of 1846 brought thousands and thousands of Irish citizens to the United States. U.S. citizens were influenced by the Irish traditions and adapted them by dressing up in costume and going house-to-house asking for food or money. This practice eventually became today's trick-or-treat tradition. By the 1920s and 30s Halloween became a secular yet community-based holiday with parades and town-wide parties as featured entertainment. Halloween activities include: trick-or-treating, costume parties, carving pumpkins into jack-o-lanterns, lighting bonfires, apple-bobbing, visiting haunted houses or attractions and watching horror films. Trick-or-treating is believed to have originated from the All-Souls Day Celebration in the 8th century of England. Poor citizens would go door-to-door asking for "soul cakes" and would receive them in exchange for praying for the donor's dead relatives. The distribution of soul cakes was encouraged by the church as a way to replace the ancient tradition of leaving food and wine for the roaming spirits. Today trick-or-treating is an activity generally for children on or around Halloween. They proceed from house to house in costumes, asking for treats with the question, "Trick or treat?" The "trick" part of "trick or treat" is a threat to play a trick on the homeowner or his property if no treat is given. It has become socially expected that if one lives in a neighborhood with children one should purchase candy in preparation for trick-or-treaters. Click here for costume ideas! If you are in the mood for a scary horror film, this one will give you the creeps! Written in 1978, this film stars Jamie Lee Curtis. HOW TO CELEBRATE HALLOWEEN IN THE USA! Jack O'Lanters are a fun and creative Halloween tradition. The top of a pumpkin is cut off, the insides are scooped out, an image (usually a face) is carved into the pumpkin, and then the top is replaced. At night you can place a candle inside to light up the carved image. The scarier, the better! 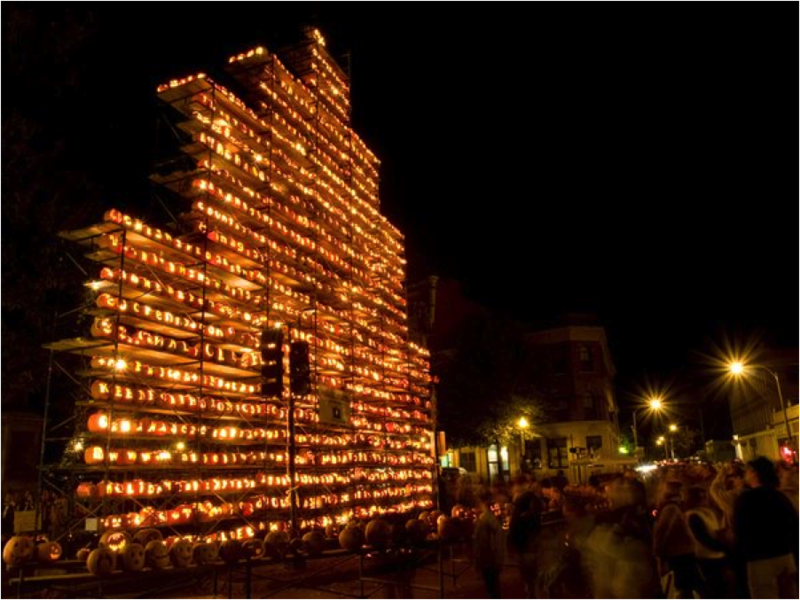 Check out Jack O'Lantern events and contests near you, including the one linked above—The Great Jack O'Lantern Blaze! Chicago does not hold back for their Halloween celebration. This year they will be celebrating October 25 – 27 with various fun activities around the city – don't miss out! This annual FREE event takes place in the Los Angeles, CA neighborhood of Hollywood. Arrive prepared: IN COSTUME! New Orleans, Louisiana fills with free events around the city on Halloween and the day after on All Saints Day. Don't forget your costume! Salem, Massachusetts is rich with Halloween and Witch History. This annual celebration commemorates the Samhain tradition. Ever heard of the legend of Sleepy Hollow? Halloween is the perfect time to experience it first hand by visiting Tarrytown, NY and participating in their countless SPOOKY activities. This parade takes place in Manhattan's Greenwich Village, and you can march in the parade itself if you are in costume! More than two million spectators attend this parade every year.